Chris Delias is a true artist in the making; someone who is as passionate when he interacts with his work as he is when he does so with the world around him – the characters that populate his paintings mingling as actively with one another as they do with the imaginary worlds he so deftly paints for them; his inner world and imagination energizing his work from his very early works. His work, reminiscent of Pop Art, is focused on daily urban life – symbolizing the elements of new technologies and social media networks that include: Facebook, WhatsApp, hashtags, and Apple-logo; creating and esthetically unique platform. People dominate the foreground of the paintings, and are usually communicating with others; as they are in his piece: “Samantha and Selfie”. 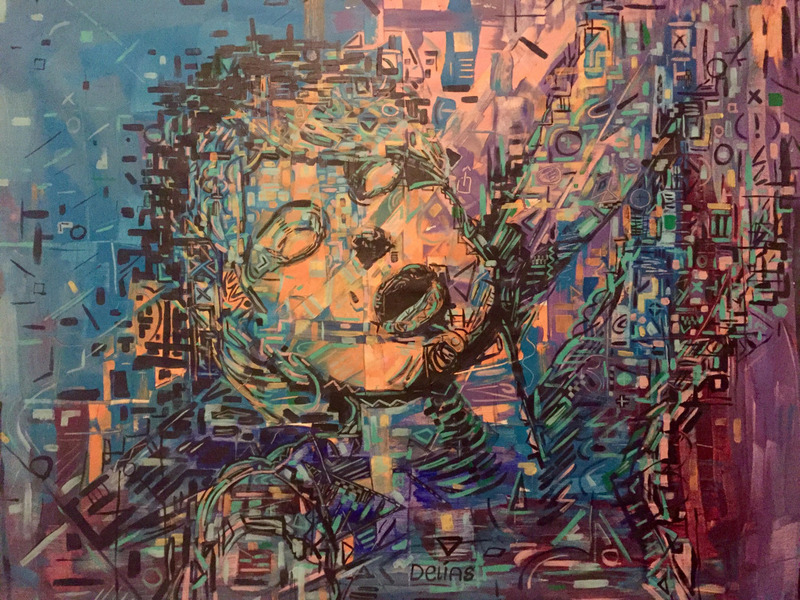 The figures – somewhat expressionist and extremely colorful – do not give the impression of being engulfed in the overwhelming impact of social media, but rather very much a part of the actual -barring technological development – but instead, employing these elements to share and express their emotions and feelings. Although, Chris is no stranger to the risks that the banality of technology subjects us to, and in a recent interview by Art Daily News International Magazine reflected on his philosophy on the subject: “My art needs to be viewed as a counterpart of all of this ‘Anti Real Relations’; for me, the center of everything is to be found in the beauty of humanity, the emotions, and human interactions. This can only be felt when one is among other human beings; not from a Smartphone or a screen”. Chris is in love with “fauve” colors, and in love with the world. He is an artist capable of enjoying and nurturing his creativity through everything that surrounds him; even with something as simple as strolling down a city street. A perfect example of this is his series: “Time Square, New York”, where he feels as free as the figures that he painted; which results in works that are loaded with a history created by the environment of the area. Another great example of is: “Nina and Layla”. His work is a cornucopia of the color, the music, the pathways Vienna (his home country); as well as social media’s influence in our contemporary global society.